Everybody loves the holidays. The time for loving, sharing and giving. It is also the time of year when the melodic tinkling of sleigh bells can be heard. While synonymous with the holidays, it isn’t the only time the bells chime. The tiny tinklers are often incorporated into handheld musical instruments that are used in percussion bands. They have a distinctive sound that is light and joyful. 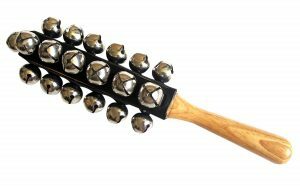 Sleigh bells are generally small metal balls with a lying ball bearing lying loosely in the centre. The simplest designs are usually made of sheet metal which is bent into the distinctly spherical shape. There is a ball bearing or a small metal rod placed at the centre. This kind of design often has variations of two or four leaf versions. In some instances, the two halves may be crimped. Larger bells often incorporate glass balls as the ringer. Centuries ago these kinds of bells were used on horses or horse-drawn carriages. They were fastened to the harnesses of the horses so that they jingled with each movement. These were often used to signify the arrival of someone of importance or warn pedestrians of oncoming traffic as it were. Sleigh bells are most commonly used in Christmas decorations. They can be incorporated into wreaths, worn around the neck or as ornaments themselves. Made from metal, shapes that define the season are often cut into the shell of the bell. Different variations of decorations incorporating jingles have been created for a variety of different celebratory seasons like Halloween. Handheld musical instruments can be made by fixing a number of the musical balls to a centre spigot leaving room for you to hold and shake. The distinct jingling produced by sleigh bells transports you to a special time of year.